Fuzzy Kudzu is stitched almost entirely from used stuffed animals donated by the local Roanoke Goodwill. Most of its “pelt” is recycled from discarded teddy bears, bunnies, and kittens, each taken apart by the artist and reassembled into over fifty “vines” ranging from twenty to thirty-four feet. Weighing nearly a ton, Fuzzy Kudzu is comprised of faux fur fabric, polyester fiberfill, and more than one thousand stuffed animals. Open for interpretation, the resulting shape can be seen as a waterfall, tree trunk, or column—something immediate and organic, yet elegantly classical. Like much site-responsive sculpture, it also morphs with changes in light, be it the movement of the sun or black lights trained across its soft, articulated surfaces. Born in Roanoke, Eaton is very influenced by the West Coast art scene of the 1990s. Working in Los Angeles at the same time as acclaimed artists Mike Kelley and Paul McCarthy, who used re-purposed mundane materials in their works, Eaton saw thrift store cast-offs as symbols of a consumer culture gone awry. Says Eaton: “Making art out of junk is my therapeutic strategy for coping with the human condition, with the clutter of the world.” At the time, he started buying trash bags full of used stuffed animals to make his works, beginning with a series of “cured teddy bears (curing them of their cuteness by burning and other surgeries).” In the past few years his pieces have grown more abstract, where wall constructions are dominated by red or blue clumps and animals’ faces either missing or buried. By limiting color and suppressing cuteness these recent works explore sculptural form and texture, allowing broader references to the body, living organisms, and emotional states to emerge. Fuzzy Kudzu represents for the artist the culmination of years of creating unfamiliar experiences out of familiar found objects, a passion that began when Eaton worked on movie sets and floats for the Rose Parade during his time in LA. Eaton studied at the San Francisco Art Institute, has a BFA in sculpture from Virginia Commonwealth University, Richmond, and as a fine art fabricator assisted on large-scale projects for key contemporary artists, including Jonathan Borofsky, Niki de Saint Phalle and Robert Therrien. His work has been in dozens of group and solo exhibitions across Virginia, including the juried From These Hills show at the William King Museum in Abingdon, and New Waves at the Contemporary Art Center in Virginia Beach. As an art community organizer, Eaton is best known in the region as one of the founders of Roanoke’s Marginal Arts Festival and PROject proJECT, both which seek to energize Roanoke’s downtown through unexpected outdoor art installations, projections, and collaborative performances. Fuzzy Kudzu is Eaton’s largest sculpture to date, and is presented in conjunction with Eaton’s solo exhibition Tournament of Kudzu Parade at Roanoke College’s Olin Gallery, curated by Gallery Director Talia Logan and on view September 5 – October 5, 2014. 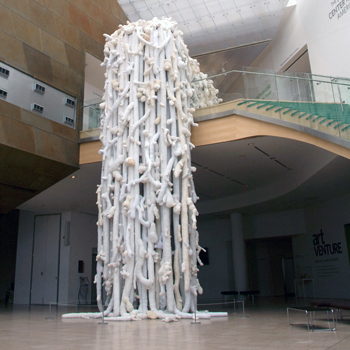 Ralph Eaton: Fuzzy Kudzu is a reuse/recycling partnership between the artist, the Taubman Museum of Art and Goodwill Industries® of the Valleys. 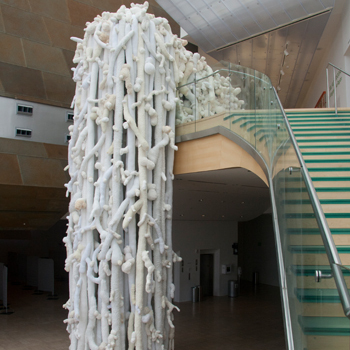 This exhibition has been curated by Leah Stoddard, Adjunct Curator of Contemporary Art, Taubman Museum of Art, and will be on display in the City of Roanoke Atrium July 22, 2014 - January 17, 2015.